While Netflix has become the pre-eminent online streaming – and now, in some markets, downloading – TV/film service, some 4.3 million of its members still subscribe to its DVD rental service. The Los Gatos, California-based company, that spun its DVD-by-mail operation off into a separate website – DVD.com – in 2012, has released an app, called DVD Netflix, for their DVD clients. The app is only available on Apple’s iOS in the US, the only country where the DVD service is offered. The new app helps customers to browse a vast number of DVD and Blu-ray titles found in their catalog, manage their Netflix disc queues, get movie recommendations, access their accounts and receive notifications with their next disc shipping. For recollection, Netflix launched its DVD-by-mail in 1998. In 2010, the subscribers still totalled 20 million. In 2014, the number fell to 6.26 million, and to 5.3 million in 2015. Last year, the 4.3 million subscribers were still generating around $132 million for Netflix. For some film buffs, physical DVDs offer a richer selection – from cult classics to first-run releases – more than in the limited streaming selection. Another reason is poor access to high-speed internet. Experts consider 25Mbps the minimum internet speed to optimize native 4K content delivery. According to the FCC 2016 Broadband Progress Report, 10% of all Americans – 34 million people – lack access to 25Mbps download/3Mbps upload. Of those, 39% of rural Americans lack access to these speeds, and 20% of them don't even enjoy 4Mbps/1Mbps internet speeds. For these populations, streaming isn’t an option, but getting a movie from Netflix DVD or Redbox is, Itechpost points out. The Daily Dot reports that mail order DVD company Redbox is even bigger than Netflix, with 1,950 discs rented per minute and around 1,080,000,000 discs and movies rented per year. 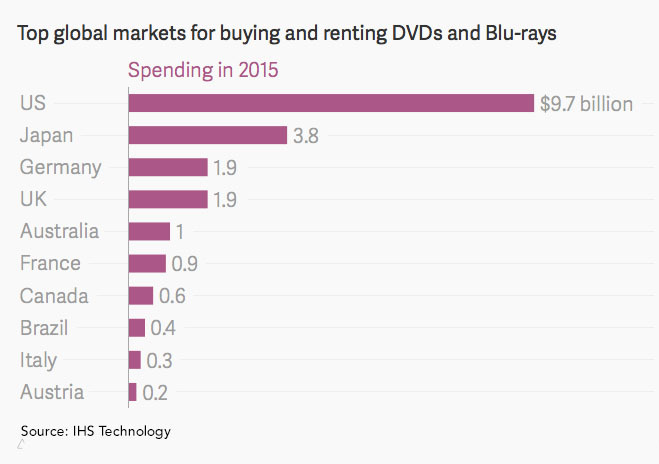 When all is said about the disappearing physical media, DVD is still a $23 billion global business (see chart).